Steve Abrams, a key member of the London 1960s counterculture, died last week. 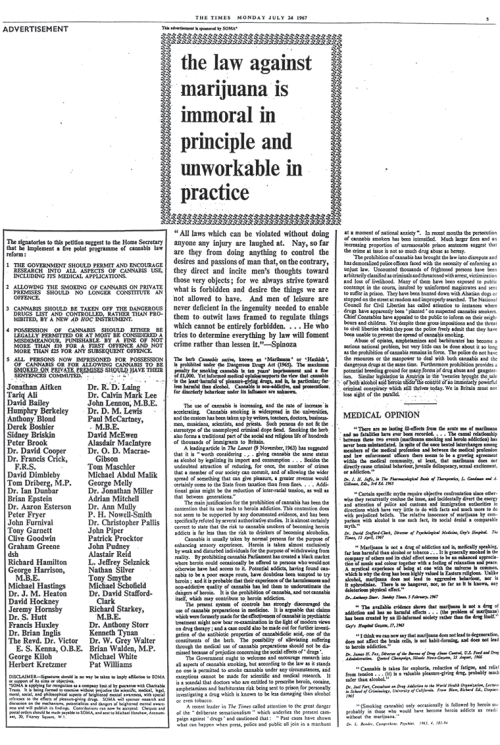 Abrams was principally responsible for the above advert, which ran in The Times in July 24 1967 declaring that ‘The law against marijuana is immoral in principle and unworkable in practice’. The advert was paid for by Paul McCartney and was signed by numerous celebrities, including all four Beatles, Francis Crick, Graham Greene, David Dimbleby, Jonathan Miller, Brian Walden and many others. It is less well known that Abrams was also involved in Timothy Leary’s experiments with psilocybin, taking the drug at Harvard for Leary in 1961. Abrams then described his experience as ‘very pleasant’, giving him ‘tremendous insight’ even if it was ‘somewhat alien’, and he was ‘very eager’ to try it again, which he most certainly did. After the The Times advert, Abrams co-organised a pro-pot rally at Hyde Park in 1967. Everybody got very high, including guest Allen Ginsberg, who wore a virulent psychedelic shirt given to him the day before McCartney and was warned by police for disturbing the peace by playing his harmonium.